Sometimes two of your favourite things come together, and the results can be glorious. And so it was when America's longest-running animated sitcom ever met Japan's biggest animation studio, In the clip released from this Sunday's episode of The Simpsons, the show's producers decided to pay loving tribute to Studio Ghibli, and specifically the one-and-only Hayao Miyazaki, who last year announced his retirement. Eagle-eyed Ghibli fans will spot plenty of references to the master animator's films- most obviously Spirited Away and My Neighbour Totoro, but also Kiki's Delivery Service and Howl's Moving Castle. Even the music is a pitch-perfect recreation of the style of music Joe Hisaishi brings to the film's beautiful scores. It's an irresistible mix for any animation fan! 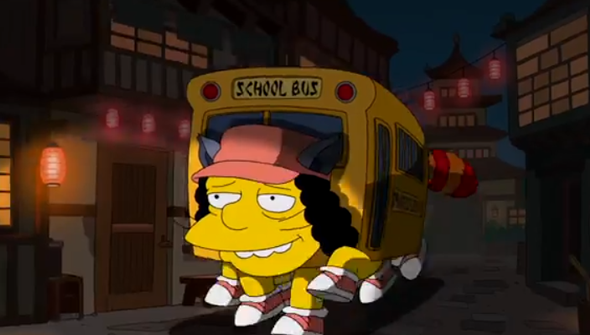 Watch out for Otto as Catbus (from Totoro), Apu's Moving Kwik-E-Mart, and plenty of other hilarious references. How many did you spot? Check out the clip below.